What are you looking forward most to in the conference this year? I’m looking forward to meeting lots of new people and getting to participate in an event much larger than I am. I am also very excited to be able to work hand in hand with other people whom I may not know, to be able to solve the world’s major issues. What made you take part in MUN in the first place? I’ve always heard that MUN was an experience that cannot be missed, and it has truly lived up to that reputation, if not exceeding to it. What is your favorite MUN memory? Winning the best lobbyist award in my last MUN conference. What was your favorite MUN conference? Just hearing and knowing that everyone had fun while feeling like i helped them add something to their confidence and skills. Also having the feeling of accomplishing something new that added to their life like submitting their first resolutions, or talking for the first time or winning an award for the first time. 2015 Cairokee outing and 2018 outing. They were moments of absolute pure happiness. It has become a second home. I’ve been participating in MUN for about 4 years and this is going to be my fifth, and it’s something I never regretted being a part of, that’s why this year I wanted to take part in the organizing committee for the first time even though I’ve been participating as a delegate for 4 consecutive years. HIAMUN ’15 because Cairokee performed at the outing and that was a day I would never forget. I’d say the last HIAMUN when I was the chair of ECOSOC. If you could go back in time what would you change in your MUN experience and why? I would turn in my first chair report (in grade 9) on time for a chance to attend TIMUN in my first year for a more well rounded experience. A close friend of mine, once told me “learn to unlearn”. Such an interesting quote right? Seeing that this is my second year to be part of the AC, it is very natural to have a tendency to repeat whatever was done last year and zoom out any room for creativity and new thoughts. If I had been aware of such concept earlier, I would have been very keen to initiate and embark to new measures to builder a much more pensive relationship with my delegates. It came to my realization that we have as AC members can have a huge difference on our delegates, we could actually teach them something like pushing them to get out of their comfort zone. And hence, I would have taken the matter to the next level. Thankfully, HIAMUN ‘19 is still months away and I still have time to do that! It’s a new year for memories, experiences, and conferences. The Academic Committee and the Organizing Committee are getting ready for this year’s conference. The OC are getting their plans ready and getting everything sorted for the upcoming conference. The AC are getting their delegates ready for the conference and training each and every one of them, and throughout this hectic process there’s always someone who’s never done it before. This is why we interviewed our youngest AC members, Nour Amr (chair of the General Assembly) and Alia Emara (chair of the Human Rights Council) to get to know how they’re feeling about being chairs this year. What is an obstacle or a challenge that you think you’ll face? Alia: An obstacle I feel that I will face is that I know I will have friends in the forum, however, a part of this experience is learning the professionalism that accompanies it. Also, I feel like during the actual conference I don't know what is waiting for me in a sense; this is my first time as an AC, so I have no expectations, but, I know that I will get a hang of it, hopefully ending this experience positively. Nour: I feel like as I get older and my MUN experience grows, I’ll start to worry more about others rather than focusing on myself. Comparing yourself to others is never healthy, however when many people excel at the same thing, it’s inevitable really. In this conference, the thing I think will really challenge is me is to be able to balance between fun and work as a chair, because the forum shouldn't be too strained but shouldn't be too chaotic as well. What do you think you’ll learn out of being a chair? Alia: The main thing I know I will learn our of this position is time management, and the prioritization of what's important over what isn't. Also, I have already gotten glimpse of the time sacrifice I have to make, since in summer I was working on the Chair Reports. I think that another thing I will learn is, being exposed to different people with different opinions, and this I believe will help me later on in life. Nour: I think that something I'll definitely learn is better communication skills, and how to have more confidence when speaking in front of a group of people. I also thinking that checking the delegate's resolutions will help me learn how to write my own resolutions better. What your expectations are for this year’s MUN. Alia: I expect this years HIAMUN, to be the best one yet. The topics are wide-ranged and very interesting, and the debates will surely be amazing. Also, with the AC and OC this year, it being a fun conference is rest-assured. Nour: An enjoyable, well-rounded, exciting, constructive, and phenomenal conference, an intellectual explosion. What are two things that you’re looking forward to the most? Alia: I'm looking forward to many things this HIAMUN. I enjoy meeting new people, and I thoroughly enjoy good debates. Also, I'm very excited to be in the AC, this year so I believe that the journey to the conference will be as fulfilling as the conference itself. I'm also looking forward to seeing my forum come together, and to meeting the delegates we have in the HRC this year. Nour: Definitely the food, but also meeting as many new people as I can and gaining more knowledge from them. Every year, delegates are buzzing with extreme excitement; wanting to know their forums and of course, working passionately on their resolutions. The Organizing Committee spends countless days and sleepless nights finishing everything that’s needed to be done, from editing videos to finding sponsors, with only one thing in mind: to make this the best conference yet. The Academic Committee devotes their time researching and typing away, creating outstanding chair reports for their anticipating delegates. With all of these individuals and teams working eagerly, there is one team merging everything together and that is the Executive Team. Malak Hassaballah (Secretary General), Yasmine Amr (Deputy Secretary General), and Ameena El Agha (Deputy Secretary General) are members of the HIAMUN 2018 Executive Team. They are the backbone of this conference. They exert their time and effort to make this an amazing conference and experience for all. This year, we interviewed the Executive Team in hopes that all of you get to know them. How do you feel knowing that this is your last HIAMUN conference and what will you miss most about it? Malak: HIAMUN has, from the start, been a huge part of my high school experience, and knowing that I will no longer be able to attend a conference devastates me. I will definitely miss the spirit of the conference shared among, not only the AC and OC, but the delegates as well. Yasmine: I feel both happy and sad that this is my last conference; happy that I get to spend my last one alongside so many people that are passionate about what they do, and people that make it all more fun, but sad just because it is the last one, and it's an experience I'm going to miss looking forward to. Ameena: Thankfully this isn't my last HIAMUN, stay tuned! How is being part of the executive team different from being a delegate? Malak: Being in the executive committee, I get to help bring the conference to life, alongside my outstanding deputies, and of course, Mr. Karim El Dib. From proof-reading chair reports and going over OC plans to checking if all the placards are in place, the executive committee organizes the conference from scratch. Delegates, though, experience the outcome of our efforts and add their own to the conference, contributing to its success and embodying the energy that makes HIAMUN what it is. Yasmine: Being part of the executive team is a lot different from being a delegate. Needless to say, the responsibility becomes a lot bigger because we're not just responsible for ourselves, but for every delegate who attends the conference and it is our duty and their right that we give it our all to make it the best they've experienced. But still, whether you're a delegate or a member of the executive committee, you look forward to the conference and get unbelievable excited as the date nears. Ameena: The two experiences are worlds apart. Being part of the executive team requires a year-long commitment where you have work to do almost every week. The work itself is more organizational than anything else, and your purpose is to give the attendees the best experience they can possibly get. Being a delegate, on the other hand, requires more academic work over a much shorter span of time. It's a way to better yourself and have a good time simultaneously. To put it simply, both experiences are completely different but satisfying in their own ways. Describe in one word how you felt when you were chosen as part of the executive team? What makes HIAMUN unique in comparison with other MUN conferences that you have attended? Malak: I think what makes HIAMUN unique in comparison to other conferences I’ve attended is that HIAMUN caters to individual delegates. Whether it’s through training sessions, one-to-one feedback on resolutions, or personally encouraging delegates to speak, presidents and chairs are always ready to support the delegates in their forums. In addition to that, HIAMUN has its own traditions that are carried on from session to the next, such as the chocolate fountain and the character of the year. To me, this makes HIAMUN very unique. Yasmine: There are alot of things that make HIAMUN unique. HIAMUN, is a family, and there's always room for anyone and everyone. Every delegate can find help when they need it whether or not they are able to ask for it, because their chairs make sure of it. Every delegate has the equal opportunity to say what they want to say, because their chairs make sure of it. It goes without saying that our chocolate fountain also adds to the magic. Ameena: HIAMUN is a melting pot of people with creativity, commitment, and professionalism. As cliche as it sounds, those people are doing their jobs because they love what they're doing and they believe in the conference's potential. Everyone who participates in the conference, from the delegates to the AC and OC, are aware of its high standards and they work to satisfy those standards. What is the most memorable moment you have encountered from all of your experiences in MUN conferences? 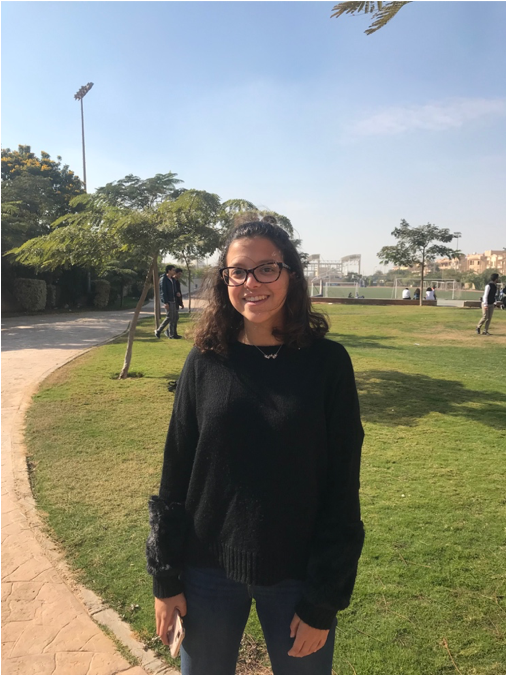 Malak: My most memorable moment from all my MUN experiences was when Yasmine, DSG, and I were in the ICJ, and during the cross-examination of a witness who had forgotten his hypothetical name he claimed that it was because the day of the event we were questioning him about was "very stressful". His excuse left us all laughing! Ameena: The moment when I heard that we'd won our ICJ case at AISMUN 2016, which was gratifying after all the effort that we'd put into it. Lastly , do you have any advice to those joining MUN as delegates for the first time? 1. Speak up, even if you’ll have to get out of your comfort zone. 2. Open yourself to a wide range of ideas that can be added to your resolutions. Also, amendments aren’t meant to be a personal attack on you. - Enjoy the experience while it lasts! Yasmine: As someone who once joined MUN for the first time as a shy child, my advice is to look at that confident delegate standing at the podium and remember that they, and every other delegate, was once a first-timer as well, and that if they can seem so confident and express their ideas so unapologetically, why can't you? So speak when you have something to say, and listen when others have something to say and you'll do great. This year, HIAMUN’s theme is Kaleidoscopic. Kaleidoscopes are representative of diversity and perspectives, so is every issue negotiated and discussed in MUN. We must bring ourselves to look at the issues we deal with from different perspectives, considering every subject’s standpoint and view. This week, we interviewed Salma Soliman, one of our Deputy Secretary Generals, to get her take on the experience of planning for the conference. · What’s your favorite thing about being a deputy? It’s definitely witnessing the conference come to life. Being a deputy allows me, along with the extraordinary team alongside me, to build the conference step by step. From outlining committees’ plans to counting the last delegation’s flags, I get to see and contribute to how the integrated efforts of everyone compile to form such a conference as HIAMUN. · How does being a deputy feel compared to being a delegate for the first time? Is it the same nervousness and excitement? The first time being a delegate is always an unforgettable experience, whether from the nerves you get standing up on the podium for the first or writing out your first resolution. I would say being a deputy is a relatively very different experience. I engage in a different type of work where we carry the burden of trying to make sure the conference is the best experience possible and reaches and exceeds standard. Therefore, the nerves still exist, but just appear for different purposes. I believe engaging in any MUN conference is a very exciting experience regardless of the position held in the conference. It always gives me a chance to explore new areas of myself and do things ‘out of the routine’. · Does being in MUN inspire your future career in any way, or is it just a hobby? At first, I started MUN as a hobby, and it was one of the activities I was very passionate about. However, my ultimate goal now is getting to work in the UN’s ECOSOC, merging two of my favorite fields; MUN and Economics. · Can you give us insight on the load of responsibility a deputy has? As a member of the executive team, we have a lot of responsibility to make the conference stand on its feet. The height of our responsibilities lie in the planning stage for the academic and organizing committee. Regarding the academic committee, we decide on the forums and work alongside the presidents and chairs on their forums. Regarding the organizing committee, we overlook the separate branches. We also prepare for external relations during the MUN conference. · What’s your favorite TV series? Each year, HIAMUN Secretary and Deputy Secretary Generals choose participants graduating from the General Assembly forum, which they think are capable enough, to become chairs. This year they happen to be Ameena El-Agha, Anas Ismail, Yahia Beethoven and Zeina Abdeldayem. Lastly, they were all asked if they could describe their relationship with MUN in one word. Ameena thought that it would be “special”, Yahia answered with “commitment”, Anas values “hard work” and Zeina answered believes that it is about “devotion”. We are very excited and eager to see what they will add to this year’s conference with their exciting spirit. Meet HIAMUN 2017’s Deputy Secretary General, Mabrouk El-Kawass, an active high school senior with a sense of responsibility towards striving to make this world a better place. This is exactly what Mabrouk, and the rest of HIAMUN’s team, aspire to achieve every HIAMUN conference. His constant effort to grow and improve as much as possible, through HIAMUN and otherwise, comes clear in this interview, which will hopefully get you an insight into what’s behind this year’s theme, what’s to look forward to, and more. HIAMUN has become one of the very reputable conferences in Egypt. What traditions has it developed over the years and how would you characterize it? HIAMUN has always been known for its traditions of teamwork and support from all of the members. All the committees work together as a family. Aside from that, we usually have our chocolate fountain, and our remarkable opening and closing ceremony videos. There’s also the character of the year. These are things that we do regularly and we feel happy that we keep on repeating them year after year. How would you describe this year's theme, “Kaleidoscopic"? This theme is extremely special, because it covers different aspects of the aims of MUN. It shows how the same issue can be viewed from different angles, depending on the way we interpret the image in front of us. Our conclusions will be different. It's also a matter of diversity in our views and how something really simple can present something beautiful. MUN has been known to change one's perspective about important events for a long time. Would you say that choosing a theme such as Kaleidoscopic would help to introduce this mindset to the new delegates? Of course it would help to do so, as it would help them to look at the important events from a different point of view and a different perspective that will show them a remarkable outcome, thus changing their mindsets. One of the great merits of HIAMUN is its continual evolvement and evolving for the better. What are the most significant changes in this year's conference and what can we expect? There have been many changes in the conference this year, some of which have been already applied and others in the planning process. This year, we’ve added younger chairs from our school as to give a chance to the young talented MUN students, and we also added a third chair in our General Assembly forums to enable the chairs to give more attention to the delegates and to divide the work between them. Also, this year, for the first time, we have opened the door for some schools to participate in our academic committee by sending us students to take the role of chairs in our forums. We are also planning further logistical changes. If you were a superhero, what power would you choose to have? Why? I’d fly, to visit all the places I want to see for free. We met up with two of our presidents and chairs, Alia El-Kattan, President of SRCMENA and Nahdeen Hassanain, chair of ECOSOC, to get their take on the HIAMUN experience. 1. What do you like the most about HIAMUN? Alia El-Kattan: My favorite thing about HIAMUN is the spirit of the conference, whether its the Academic and Organizing Committees or the forums. HIAMUN is a well-organized, beneficial, and truly enjoyable conference that guarantees delegates and students an unforgettable experience. Nahdeen Hassanain: My favorite thing about HIAMUN is the balance that exists. Everyone has an amazing time yet also without ruining the structure or seriousness of the conference itself. 2. What’s HIAMUN’s unique point in comparison to other conferences that you have attended? Alia El-Kattan: A huge part of HIAMUN is ensuring every delegate gets the most out of the conference, which is something I haven't experienced with other conferences. That includes the training sessions many delegates receive to ensure they enter MUN knowing the expectations, the feedback and the support the AC members are required to give, and finally chairs making sure every delegate in the forum has a chance to speak in the conference. Moreover, the forum sizes allow every delegate to get the opportunity to speak and debate, in contrast to other conferences with very large forums that don't give many of the delegates a chance to participate as much as they would like to. Alia El-Kattan: My favorite part about being a delegate has always been and will always be the heated, controversial debates. The best part of MUN, in my opinion, is the debate skills you learn while trying to deliver your point through debates that are both beneficial and enjoyable. The main difficulty is the resolution-writing, as it is not easy to come up with detailed, effective, and beneficial solutions to some of the world's most controversial and critical problems. It does get easier over time, though, through plenty of practicing. Nahdeen Hassanain: My experience as a delegate has been amazing. I started out as an admin and made it a point that I participate in HIAMUN, as it keeps evolving and developing into, in my opinion, the best conference locally. The hardest part about it is the preparations that overlap with all the schoolwork. If you're new to MUN preparation, research is really important and having to find the time to make that a priority might be the challenge. HIAMUN’13 was the first HIAMUN with delegates from other schools, thanks to a powerful executive team of that year and the years before. This had a great effect on all the conferences to come. HIAMUN’14 was a year when the conference expanded to greater forums. HIAMUN’15 was the year the conference was granted the THIMUN Qatar affiliation. We interviewed HIAMUN’13 Secretary General, Malak Saleh, HIAMUN’14 ECOSOC President, Marawan Tarek and HIAMUN’15 Deputy Secretary General, Omar El-Shahidi to get their take on the experience, and how MUN has affected their life. What experience did you gain from MUN? Omar El-Shahidi: Well, I was always a shy kid, like me, standing on a podium actually speaking? No way. Then I joined HIAMUN and it gave me a lot of confidence. Now I love public speaking. I feel like it's a platform where I can express myself or show a more confident side of me, not to mention the socializing skills you gain from MUN. I can go on forever about how much MUN changed me. All in all, MUN transformed me into the man I am today. Marawan Tarek: It helped me to deal with people better and understand them more. Malak Saleh: I owe a lot of what and who I am today to that role I was given the privilege to fulfill. It teaches you how to function under stress, which you will have to a lot of times throughout university and life in general. It teaches you how to synchronize your mindset with the others working with you and I think that's the most valuable lesson I've learned because the real market and world is a tough one and had I not gotten that kind of exposure during high school, I don't think I would've handled it all the way I did. It's life changing in all sense and meaning to the word. How did having such an important position add pressure on you more than being a delegate in the past years? Omar El-Shahidi: Well, as DSG you're responsible for bring the conference to life, so it's a lot of pressure. Not only that, but we were also aiming for the THIMUN Affiliation so we really had to up our game. As DSG you connect the ideas of the SG to the real world, you really just have to pressure people into doing their best. So it ends up that you're nagging at the OC and AC to finish their work, and fighting with the SG about budget details and possibilities. So it's a lot of pressure because you have a lot of responsibilities to juggle, but I enjoyed being DSG. Definitely one of the highlights of my years in High School. Malak Saleh: It was kind of overwhelming at first, since I decided to open the conference up to other schools. It took time to choose the executive committee, to finalize all 5 forums and the press team was the toughest because the main team had graduated the year before so I sort of had to choose someone I know would be able to deal with it entirely and alone at times. But thankfully I had the best executive team and deputy Secretary General so I didn't have to do any of it alone. So having all of us work on this together I think is what made it so memorable and smooth. By the end of the process all of us could pretty much do anything. So, is being a DSG worth the trouble and the work? Or did you enjoy being a delegate better? Omar El-Shahidi: Being DSG is definitely worth all the headache. Working with Mohamed Sabry and Karim El-Dib was one of the best things that happened to me, and the feeling you get when everything falls in place is just extraordinary. During the conference though I was quite nostalgic to be a delegate again. Debating has always been my favorite thing about MUN, but if I had the option, I'd still choose DSG, hands down. If you had the opportunity to not go to MUN, would you have taken it? Why? Omar El-Shahidi: I'd still do MUN. MUN had great impacts on my character that make me who I am, so I wouldn't really let go of that. Also, the connections you gain from MUN last for quite a while. Like, during the first week of university, a couple of people knew me because I was the DSG, and it’s kind of hard not to feel proud when they say that. Are there any mistakes/decisions you took while on duty that made you rethink later when you saw its impact? Malak Saleh: Of course. Nothing's 100% perfect. And like anyone else there were things, looking back as happy as I am with what the conference was, I wish I would change or take back. A major thing was that I wish I would've delegated better throughout the pre-conference period. I think had I done a better job at that a lot of the small details I saw that could've been better wouldn't have happened. But thankfully I did have a great team and mentor that later taught me how to gradually master that skill. I just took everything Mr. Karim told me to heart and went with my gut. I had a vision about what HIAMUN was going to be in the future and worked towards that vision and goal. Marawan Tarek: Definitely, but I always felt capable because I had a great director, team and chair that supported me all the way. They really made things a lot easier for me. I was a bit scared because of the huge responsibility at first, but I was really happy that I got to do it. What is the most important advice you would give the HIAMUN’16 Secretary General? Malak Saleh: Own it. Do your position justice, and go with your gut because you got to the place you're in because of your hard work and dedication. Enjoy it while it lasts because experiences like this one are so rare! Photo courtesy of the THIMUN Qatar Facebook Page. As HIAMUN’s sixth conference approaches, the conference was awarded the THIMUN Qatar affiliated plaque during the THIMUN Qatar Leadership Conference, QLC on the 15th of October. It was accepted by HIAMUN’14 Secretary General, Ahmed-El Agha, who was a guest speaker in the conference alongside HIAMUN’15 Press Head, Youssef Ramzy on “Photography & Videography in MUN Press Teams”. We caught up with the alumni to discuss their HIAMUN experiences and the impact it had on their lives post-school. What would you say about the significance of Press Teams to a conference? Youssef Ramzy: The press teams are the ones that make the conference successful. They basically do everything from advertising the conference, up until documenting the conference itself. A press team is an essential and key element in any MUN conference, it is an important need to create a successful conference. The press team is what makes the conference an actual conference! What do you think is so unique about HIAMUN that has gotten it so far? Ahmed El-Agha: I think HIAMUN is the perfect balance between fun and seriousness. The level of debate is very high, and at the same time the delegates have a lot of fun. It isn't easy to find that combination in an MUN conference. How has contributing to HIAMUN affected you personally and helped develop you? Youssef Ramzy: Contributing to HIAMUN had a great impact on me, I can say that it gave me the motivation to work with many different people no matter what conflict I faced. It made me practice my leadership skills, especially as a press head, and it definitely affected me in terms of organization and time management. Because one day in our lives we will have to face the true meaning of being leaders, and we will face many complications we will have to solve. So yes, HIAMUN had a great impact on me in who I am or what i do today. Ahmed El-Agha: MUN took me out of my comfort zone, and made me more comfortable with public speaking and communication. Participating in HIAMUN helped me push that further because I was doing it with people I already knew well, which also added to the fun. The executive positions helped me in leadership skills and decision-making. In fact, I got to develop these skills ever since my first conference as a delegate, since even in that position you're technically taking decisions on behalf of a country! Participating in MUN has definitely affected these two alumni positively, from being Secretary General to Press Head, the leadership positions that they have taken on have helped their organizational skills, decision-making and more, as well as their earlier roles as delegates have. It has helped them branch out to other activities and develop their skills, such as presenting at the Qatar Leadership Conference. We hope they continue to grow, along with many more students. Meet HIAMUN 2016’s Secretary-General, Mariam Hassaballah. An active high-school senior to-be that has mastered the ability to run one of the most anticipated and hopefully successful MUN conferences as of next year. Introducing someone like Mariam, last year’s GA president, is a mere formality. Assuming that you take part in the MUN community, chances are that you would be quite familiar with the name. Mariam’s notable influence on MUN grounds can be further clarified through the consideration of her countless characteristics that distinguish her as surely an influential leader. Her constant stand for what she believes in, as well as what MUN stands for, and the necessary incorporation of that into the upcoming conference, is evident in the following interview which we had the pleasure of carrying out with her. The insight regarding the theme of next year’s conference “metamorphosis” and the future of HIAMUN as well as its technical side can be obtained from this interview. Mariam Hassaballah, the Secretary-General of HIAMUN (Hayah Model United Nations) 2016. HIAMUN has developed traditions that we are keen on keeping. They may not be grand traditions, however, they are small ones that characterize HIAMUN. This would include the layout of the tables with the flags, and the outstanding opening and closing ceremony videos. I do believe, though, that with every new conference, there is a different spirit that is established by both the AC and OC. One of the goals of MUN is to bring young, bright minds together to create dialogue and interaction. Do you feel that the delegates of next year’s conferences will be able to tackle the topics and become agents of change? Each year, new delegates join HIAMUN seeking means to broaden their skills and knowledge. Mostly, the new delegates are placed in the General Assembly, and because of the exceptional guidance of the president and chair of the GA, and our director Mr. Karim el Dib, the new delegates will, in fact, be agents of change. What is the rationale behind the topic choices this year? The topics this year follow the theme of “metamorphosis,” the final change of transformation. We believe that a solution to these topics, a framework that will enable change, a prospectus would lead to total transformation in the world today. Well, it’s not one word, but obsessively organized. If you were an animated character which one would you be? Why? Mojo Jojo, I’d rather not tell you why.